Good morning everyone. The idea of being an insider this time of year is appealing especially to those of us who happen to have a wood stove to wrap ourselves around. The temperatures this past week have been a tad bit chilly. I don’t believe the thermometer here at the global headquarters broke the single digits all week long. The chickens stayed huddled under cover. It was so cold….how cold was it??? It was so cold then when the rooster crowed the steam from its warm breath froze instantly to its beak and fell to the ground . The sound never actually reached the house only a few yards away as it was frozen inside that pile of ice. Come spring all those sounds laying around the dooryard are going to defrost and the best hearing protectors around will do little to dampen the forthcoming cacophony. Maine Insiders: Barry King from Maine Office of Tourism on Vimeo. But that isn’t the kind of “insider” I was trying to tell you about. An insider is also someone who is in “the know” about what ever it is they think they know about. Last spring I was accidentally mistaken as an “insider” by the Maine Department of Tourism. They came down to Camden to take some video footage during which Colby stole the show which is why so much footage of other folks is spliced in there. At any rate, because the phone is starting to jangle with people wanting to reserve space for next summer I thought I better, in the spirit of full disclosure, let folks see what they might get stuck with (me that is). Hope you enjoy this video. And really I am not as big a blabber mouth as the video makes me out to be. Probably worse. You’ll notice the Maine Office of Tourism has pretty well buried this thing on the internet so that mothers and their children are safe from any harmful effects. Posted in camden windjammer cruises sailing vacations on January 29, 2013 by Capt. Barry. Recently at an alpine ski race I was standing in the starting gate about to launch myself down through a maze of red and blue poles stuck in the snow in a seemingly random pattern of horizontal and vertical distribution. It can be quite a thrill getting this 50-year-old body to do what my 19-year-old mind dreams of. I get nervous excitement raising my pulse at every start. Sometimes it even dawns on me that this thrill seeking activity might be a really silly or even dangerous thing to do. But it is all safe enough because I know the DIN setting for the release on my bindings will mostly keep me from harm. If I somehow get out of control and crash the chances are good that I will walk away from a catastrophic “yard sale” with nothing more than a shattered ego. For those of you unfamiliar with the term “yard sale” just imagine gloves, goggles, ski poles and skis strewn about the hill or hanging in nearby tree branches as if thrown from a helicopter. 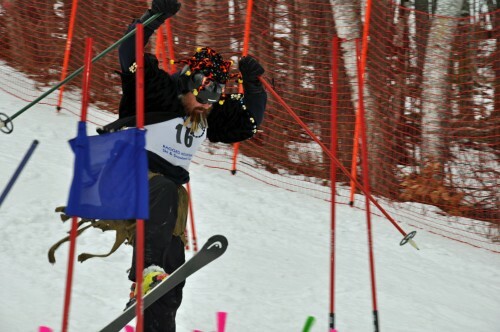 During one race I literally leapt right out of my skis at the starting gate as I kicked back to achieve some miraculous lift-off like a World Cup ski racer. Now all of this has had me thinking that life has a DIN setting too. The question is when, under extreme stress, do your bindings release and can you adjust that setting so you don’t get hurt or injure others in the ensuing “yard sale”? Experienced ski techs know that people and bindings change so that DINs need to be checked regularly with properly calibrated equipment helping each skier keep their optimum DIN. The idea is to allow yourself to neither release before you have had a chance to experience the thrill of success or release too late harming yourself and others around you. My therapist is my mental ski tech. She claims with proper care and feeding I can be taught to do simple tasks and with well-balanced medications I can actually achieve some modicum of success without hurting myself or anyone else. But sailing is my real therapy. A week out on Penobscot Bay allows me to double check my DIN setting. So, with that thought in mind, have you checked your bindings lately? Or is it time to book a cruise along the Maine coast and double check you DIN? Posted in camden windjammer cruises sailing vacations on January 25, 2013 by Capt. Barry. Good morning everyone. I probably should have posted this at Halloween. Once again, here I am, a day late and a dollar short. 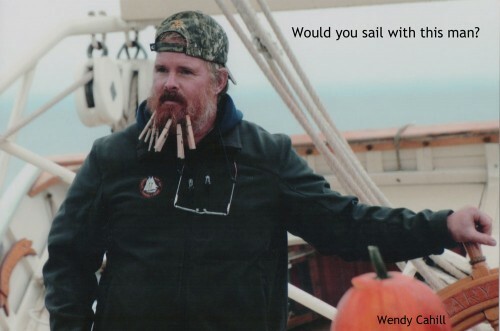 I was flipping through some wonderful pictures that windjammer guests Wendy and Jim Cahill sent to us. I got a good chuckle when I saw this picture of me during one of my more intense moments. I swear my shrink is close to getting my medications sorted out. I should be back in equilibrium by next summer. As you can see from the slack main sheet in the background this photo was not taken at a particularly breezy moment. So why the clothes pins in the beard?? If you figure it out please let me know so I can explain this to Jen and the kids. This whole blog thingy was intended to inspire folks to take a windjammer cruise with us. This kind of silliness might scare more than just a few guests away. Laughing at myself is a hobby that I (and many others) enjoy. No one really takes me that seriously so why should I. And I guess that is my thought for the day…life is too short so don’t take it too seriously or you might miss the journey. Posted in camden windjammer cruises sailing vacations on January 17, 2013 by Capt. Barry.